Johnny Russaw sings the Star Spangled Banner before a football game. Johnny Russaw knew he was going to change things when he started school at East Tennessee State University in 1964. 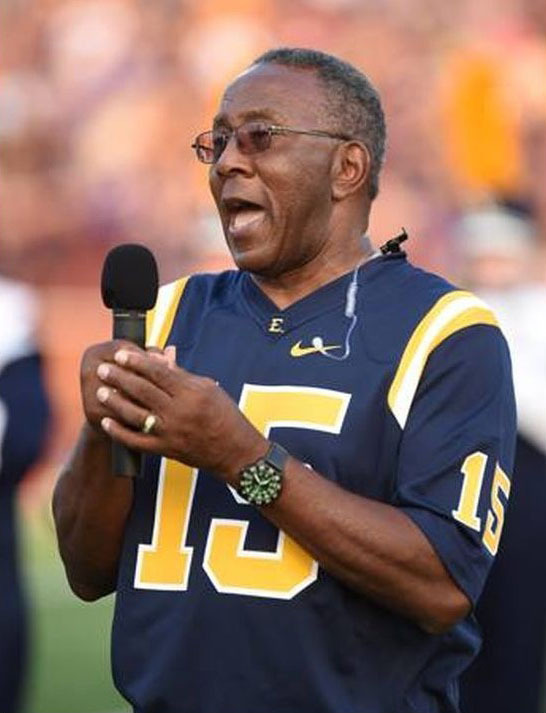 As the school’s first black football player, Russaw broke barriers while amassing a stellar athletic career at ETSU. “I knew I was going to change environments. I had always been in all-black environments. It was different at ETSU. Langston prepared me to go in and handle things like that,” he said. Russaw’s was of one of the last classes to graduate from Langston High School, Johnson City’s only black high school. Langston is also one of the few remaining Rosenwald Schools, which were built to educate African-American children across the South in the early part of the 20th century. Langston operated from 1893 until 1965 when it closed following desegregation. Russaw said the school’s academic materials were not always up-to-date. In fact, many of the books were cast offs from Science Hill High School. Even so, teachers did what was necessary to ensure students were prepared academically. “I think in looking at how it shaped my life, it made me more of a man. All in all, it shaped me to be a better man in my community and the places I’ve been,” he said. Russaw graduated from ETSU with a degree in education. He worked as public safety officer for the Tennessee Valley Authority for many years before retiring. During the next chapter in his life, he worked as a substitute teacher, often at Science Hill, and worked for a decade as housing manager at Bethel Housing, an elderly housing unit in Jonesborough. Russaw said he often tells his kids and grandkids how they need to carry on their heritage, but he recognizes they’re living in different times than he did. That’s why he thinks it’s so important to preserve Langston for future generations.